Enjoy spring through the study of nature. Visit http://www.pinterest.com/amcmontessori/spring-hands-on-activities-and-learning-adventures/ to get started today! This year commit to do something fun yet really meaningful for those in your community who are sad and lonely. Become involved in a project and possibly enlist the help of other families and friends. First, call your local nursing home or children’s hospital and explain that you would like to bring handmade gifts to the patients. Find out the dos and don’ts of acceptable gift giving. Now, get busy and go to work. 🙂 Visit the Kids Activities – Community Service Ideas website. Scroll down until you see Project Ideas. Decide whether you want to make a cooking, sewing or other type of craft project. One word of caution here. The first time we became involved in a community project, we got a little carried away by our enthusiasm and spent more than we wanted. Don’t make the same mistake. Meet with your other community project partners and agree that you will set a spending limit. To make the project enjoyable for everyone, be sure to also consider the age, ability, interest, and attention span of the children/teens involved in making the gifts. Bargain hunting does take time but is well worth the effort. These trips are useful for children and teens as they learn about budgeting, units of measurement in cooking and how much yardage of material to buy. Visit some craft, yardage and stationery stores in your area and explain what your group is doing and ask to see the discount and bins. Also inquire about possible discounts. You can also cut costs by purchasing baking items at many discount grocery chains. Below, are some additional sites and recipes to consider for your cooking projects. Although the service project mentioned in this posting is designed for the young, the elderly enjoy these projects as well. 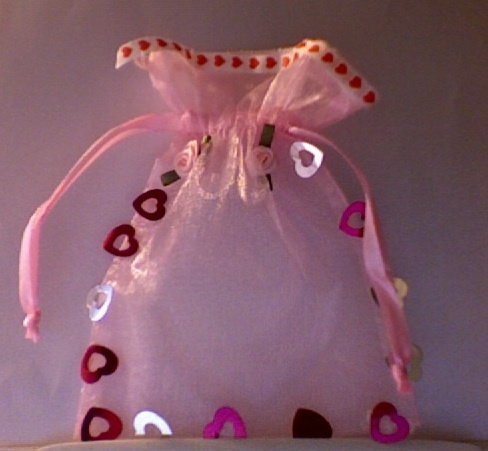 A 91-year-old member of our family recently created the Valentine bag pictured above. She continues to be housebound because of illness but is motivated to reach out and help others. She currently is making these organza Valentine bags to give to women in need. We did some bargain shopping and found some good buys through eBay auctions. Among the best bargains were the satin rosettes and organza bags. By clipping coupons and waiting for sales, we were also able to purchase ribbon and other trimming at deeply discounted prices. This year, we knew that it was mandatory that we stay within our budget. Again, we made some price comparisons and found some very inexpensive lots of lip balm, mini hand lotion, etc. These items will be inserted into the 30 completed organza Valentine bags and given as gifts. May the love and compassion that you send out to others be returned to you. Visit American Montessori Consulting and look under New and Notable for other holiday related lessons and unit studies.